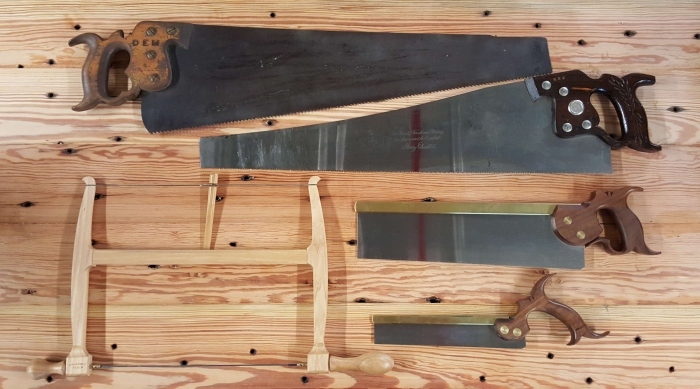 I get routinely asked what saws someone needs for woodworking and why some people have so many saws and do I need one of every type. When one is a professional, working by hand, having a perfectly tuned tool is productive. Historically each trade had it's own specialized equipment which in each case was tuned for specific tasks more efficiently than the generic version of the same tool. In the United States, where houses were predominately made of softwood, the generic 26" crosscut saw more than suited most tasks. For most carpenters, specializing on one area of the trade, a very small number of saws were actually required. Speed was everything and there was nothing to be gained by using a dull tool, or the wrong tool. Duplicates were needed so that during the course of a day as tool started getting dull, one could switch to a sharp saw (and have someone else sharpen the dull one). For a carpenter who did a diverse set of tasks, for example on flooring where the underfloor might be of pine and the finished flooring oak, separate saws filed for both soft and hard woods would be wanted. And that made professional sense. But, and this is important, except for the most common saw - a handsaw used for crosscutting softwood, which rips abysmally, most saws can be used for most tasks. This is especially true with hardwoods, and our combo filed sash saw is basically a rip saw with a little negative rake and fleam so it cuts great on hardwood in all directions. But if I was cross-cutting pine 2x4's all day I would want something with far more fleam and rake for faster action. "one size fits all" may not be appropriate for traditional professionals but for everyone else one sharp saw is perfectly adequate. In my toolbox I have five saws. First up are two 26" handsaws, both by Disston. I used a pair of for years which were I liked a lot, but about a decade ago I got the saw collector bug and found these Disstons, and that's what's in my tool box now. Over the years my backsaws have evolved from a Sanderson I bought from Garrett Wade in the early 80's (or '70s I don't remember), and then some Adria saws, but now I my backsaws are totally Gramercy Tools (which of course makes tons of sense on lots of levels) but I only use two backsaws, a Gramercy Tools Sash Saw and a Gramercy Tools Dovetail saw. For curves and cutting waste I round out the lot with a Gramercy Tools Turning Saw. That's it. I used to have an cross-cut carcase saw but I don't use it anymore as the sash saw is combo filed and fits the entire bill for sawing straight joinery cuts except when you need a smaller saw. So i took it out of my tool box where it was wasting space. In the near future I will probably add a BT&C Hardware store saw, simply because it's a shorter, cuts faster, and also useful for carrying around. I don't do veneering (or haven't yet) so I don't own a veneer saw (I know I can get one by walking about 20 feet in in any direction from my office but I don't have one yet), and since I have a turning saw I don't use a coping saw. All my saws are sharpened for hardwood, but they work on pine in a pinch, if not ideally. When they get dull I get them sharpened (I don't sharpen my own saws because it is far far easier and better to let our saw sharpening service do it for me - so I have never gotten the practice to be good (and I can't see the teeth anymore anyway). I don't feel the need to have duplicates of the saws. I have lots of saws I don't use, I got them because I collect tools and they are a useful reference. By keeping the actual number of saws I use sharp and accessible and ignoring the rest, I don't have to justify why I own so many saws, and waste time looking for the saw I actually want to use. It's right there in my toolbox. I love your sash saw, reach for it at every opportunity and as you know I made the handle out of highly quilted maple. My principal point here is I really like the rather inexpensive Crown pistol grip back saw, 8" length. I nearly insist students acquire one of these and learn to file it to a rip set. My beginning students have good success with mastering these saws, just turning the round handle in their hands for dovetail boards. (Pins first, of course). Mornin', everybody! Just wanted to send out congratulations. Christopher Schwarz gave the saw a very favorable (and well-deserved IMHO) review in the most recent issue of Popular Woodworking. I predict a big jump in orders, and more than a few requests for a 20-22" version.